There is so much love for the European leagues but you can’t take away other forms of football. A game of 90 minutes is always a joy to behold especially if you have your stars playing. 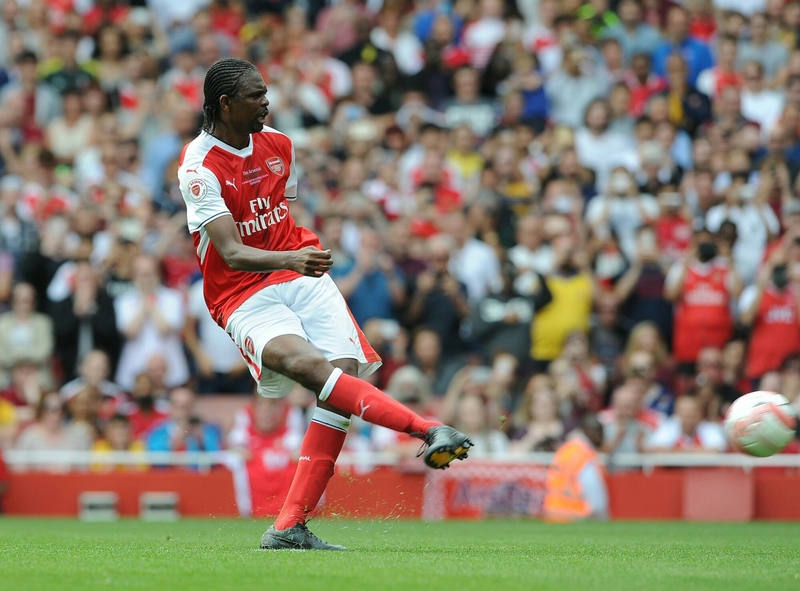 At the weekend, Kanu returned to Arsenal and grabbed three goals for himself in an exhibition game at the Emirates. The Legends match was to raise funds for young people in Jordan, Somalia and London. The Arsenal Legends defeated AC Milan Glorie 4-2. The Emirates fans had the luxury of watching greats like Robert Pires, Kanu, Gilberto, Seaman, Lehman, Winterburn, Parlour, Ljunberg, Overmas, Keown, Toure and *coughs* Hoyte etc. But Kanu stole the show. He promised to score three and he delivered. Kanu believe it? Away from the exhibition at the Emirates, Kelechi Iheanacho scored his 3rd goal in 3 consecutive matches for the Super Eagles of Nigeria in a 1-0 victory over Tanzania at the Godswill Akpabio International stadium in Uyo. The Manchester City striker scored in the 77th minute after receiving a pass from the corner kick spot. The Eagles missed a lot of chances with Victor Moses the major culprit. Odion Ighalo aslo fluffed his lines. Nigeria had a very poor final third display and were kept a bay by the Tanzanian goalie. A dead rubber game but a rehearsal for the 2018 World Cup qualifier against Zambia next month. The biggest result in the NPFL over the weekend was the 4-0 whitewashing of Rivers United in Enugu. Sitting at the top of the table, Rivers United needed at least a draw to remain on top but hosts, Rangers, were having none of it. Rangers move to the top with 4 more games to the end of the season. Can they break their 32 years wait for a trophy? Ikorodu United took Owerri by surprise with a 1-0 win over Heartland. The home side have been flirting with relegation since the 2nd half of the season and needed to defeat 19th placed Ikorodu United to move up to 14th but will now make do with the reality of the quagmire at the bottom. Can Heartland survive? They have never been relegated before. Change!! Lagos based Ikorodu United will enjoy the victory – their 1st away victory in the NPFL and their 1st double over any NPFL side. With 4 games to go, they can prepare well to come back quickly from the NNL. In other results, Champions Enyimba lost 1-0 to Lobi Stars, Warri Wolves moved out of relegation with a 1-0 win over Nasarawa United. The troubles of MFM FC continued with a 3-1 defeat to Akwa United in Uyo while Plateau United saw off Shooting Stars 1-0 in Jos. That’s the lot for today. Happy birthday to the Odd Solace.